Defence is one of the major spending sectors in the Indian economy. The geographical and topographical diversity, especially the 15,000 km long border which India shares with seven neighbouring countries poses unique challenges to the Indian Defence Forces. This section gives complete information pertaining to the activities of Indian Army, Navy, Air Force and Paramilitary Forces. 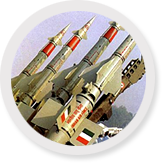 Detailed information about various defence organizations is also given.